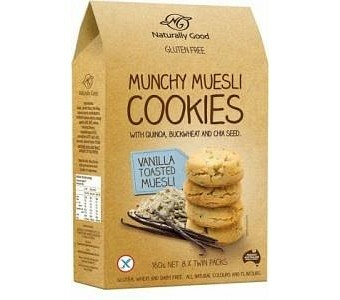 Naturally Good Munchy Muesli Vanilla Cookies are individually packed in two cookie portions convenient when you are heading out the door. Made with delicious flavours combined with supergrain goodness, Naturally Good Muesli Cookies guarantees a nutritious and tasty snack, each and every time. 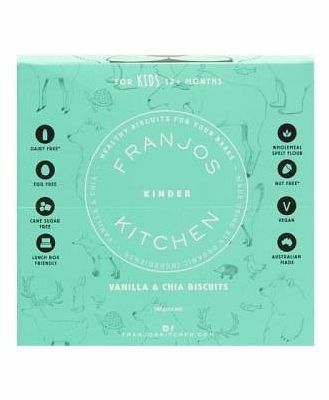 Contains quinoa flake, chia seeds, buckwheat kernel, and sunflower seeds Great alternative to muesli/nut bars Gluten free Wheat free Milk and Egg free Vegan Individually wrapped portions for convenience Lunch box filler for kids and working parents On the go breakfast alternative for busy people Under 100 calories for two cookies Contains Soya May contain traces of peanuts, tree nuts and sesame seeds Ingredients: Gluten Free Flour (Rice Flour, Soy Flour, Maize Starch, Potato Starch), Sugar, Vegetable Oil (Non-Hydrogenated), Antioxidant (306 Soya Derived), Wholegrain Cereals (10%),[Buckwheat Kernels (6%), Quinoa Flakes (4%)], Sunflower Seeds (5%), Chia Seeds (2%), Natural Vanilla Flavour (0.5%), Raising Agents (450, 500), Vegetable Gum (Xanthan Gum), Emulsifier (Soy Lecithin), Sea Salt, Rosemary Extract.